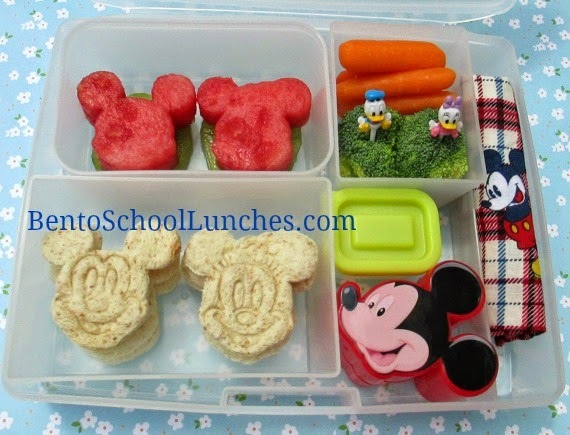 Time flies and when I looked back at my previous Mickey Mouse lunches, I discovered that they were created two years ago! It feels like just a few months ago. Laptop Lunches sent me their new lunchbox several months ago and it was a while before I put it to use, this box in translucent compared to our primary colored box. This first lunch was created with my Mickey and Minnie cutter and stamp set, and their friends Donald and Daisy are food picks. I used the same Mickey cutter to cut the watermelon slices. I saved the cute Mickey container from Nikolai's Easter egg hunt many years ago and frankly, I can't remember what I included in it since I made this lunch a while back. Bottom left: Mickey and Minnie stamped sandwiches (stacked). Top left: Mickey watermelon slices above kiwi slices. Bottom right: Food in the cute Mickey container and ranch for dip in the small container. Top right: Organic broccoli florets and organic baby carrots. 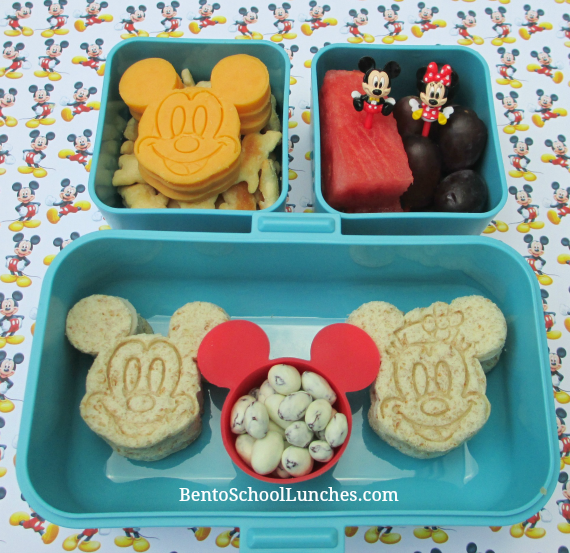 This second Mickey and Minnie themed lunch was packed in his Monbento Tresor box. I used the stamp from the cutter set and stamped Mickey's face on cheddar cheese. Bottom tier: Mickey and Minnie sandwiches. Yogurt covered raisins in Mickey cup. Top left: Mickey shaped cheddar cheese above Annie's Homegrown organic crackers. Top right: Watermelon and seedless red grapes. Both of the lunches are so cute! Thank you so much Ming, and thanks again for the cute picks!! So adorable! Love the Mickey and Minnie imprints!